Wedding cookies I made to give away as favors for wedding guests! My favorite design by far is the lace cookie, although it (surprise!) takes the longest to make too. “Macarons are the new chocolate” is often heard those days. Delicate French cookies are taking the world by storm: one can find them on the advertisement banners of top-end cosmetics companies, in the lobbies of fancy hotels, and served along your afternoon tea. You can make macarons at home and amaze your loved ones too – it only takes a little bit of practice. Macarons represent for me everything that French cuisine is about: a few simple ingredients combined with the imagination and skill to create something extraordinary at the end. Macarons will change the occasion you prepare them for into a special experience. Basic macarons recipe has only 4 ingredients. The list of things that may go wrong while you’re making them is a lot longer… But don’t let that scare you – take notes of everything you do to be able to make adjustments later, if necessary. 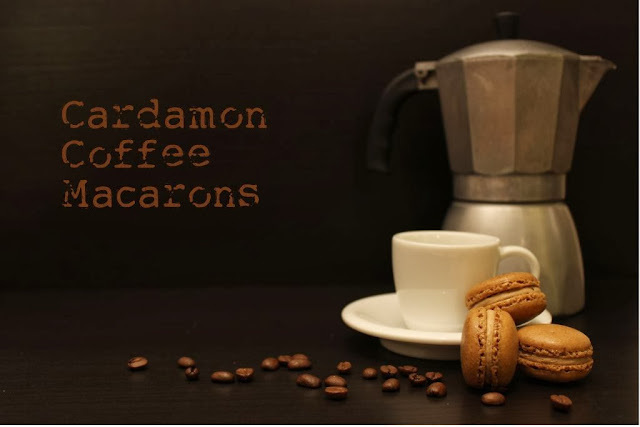 At some point I hope to get around to writing the list of things I learned about making macarons, but because fall is almost here and coziness of the season is in the air, today I would like to share the recipe that is a little bit more fancy - Cardamom Coffee Macarons. 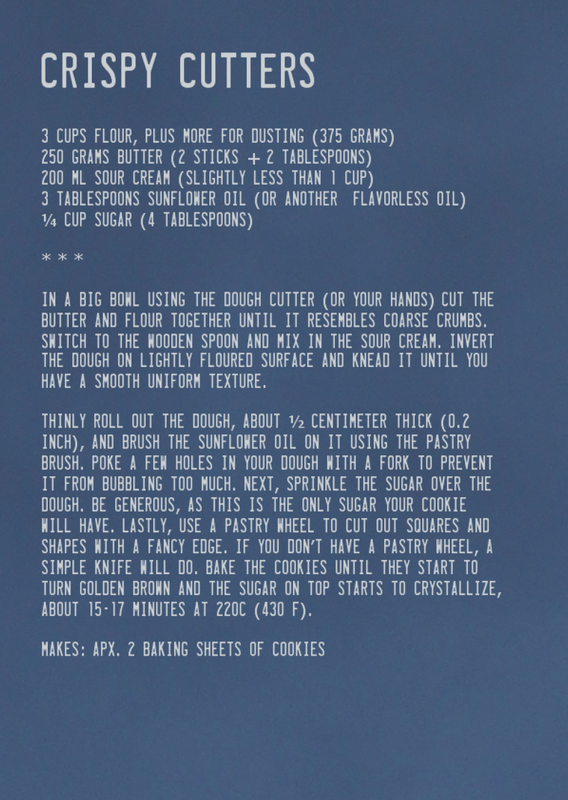 Note that the ingredients are listed in metric measurements ONLY. Macarons are persnickety, so precise measurements are important for the success of the final cookie and volume-based measurements (such as cups and spoons) do not do well here. 1. Prepare 2 baking sheets lined with parchment paper. 2. In a medium bowl, sift together almonds, espresso powder, cardamom and powdered sugar. Set aside. 3. In a large bowl mix the egg whites with cream of tartar using a hand mixer or a stand mixer with a whisk attachment until soft peaks begin to form. At this point start adding granulated sugar one tablespoon at a time, continuing to whip until the mixture is glossy and stiff peaks form. An old trick to know if meringue is ready is to hold the bowl upside down: if it doesn’t slip out, you’re good to go. 4. Sift a portion of your dry mixture over the meringue and carefully fold it in. Repeat with the remaining dry ingredients until everything is incorporated. Be careful not to over mix. 5. Load the macaronage (that’s how the mixture for macarons is called) into a big piping bag fitted with a open round tip. Pipe about 1-inch (circa 2.5cm) circles on the baking sheet, leaving enough space in between each macaron for them to flatten as they sit. Tap the baking sheet against the counter to break any air bubbles that may have formed. Then let macarons rest for 30-60 min until they form a dry skin. 6. Meanwhile, pre-heat your oven to 150 C° (300 F°) on a fan setting. 7. After macarons have set and formed a ‘skin’, bake them for 11-12 minutes, one sheet at a time. 8. Let cool completely before removing from the parchment paper. 9. Sandwich together with coffee swiss meringue buttercream. Macarons are good on the day they are prepared, but they are even better the next day. Put your sandwiched macarons in a container and store in the refrigerator overnight for best results. 1. Put egg white and sugar into a double boiler over the pot of simmering water and whisk constantly, until the mixture reaches 65°C (150°F). 2. Remove from the heat and whisk with the hand mixer until egg is fluffy and the bowl has cooled completely. 3. Add butter and flavorings and whisk until until it’s smooth and satiny. Here are the cookies I made to give as a gift on a christening day of two sweet little boys. They are vanilla sugar cookies, hand-decorated with royal icing. Check out the yellow and purple wedding cake I made. The colors were made to match the overall wedding theme, especially the bride's yellow dress. It was carrot cake filled with mascarpone icing. It was frosted with swiss merengue vanilla buttercream and then decorated with fondant. All the roses are handmade to be three-tone. I can just hear the sounds of a country fair when I make these funnel cakes in my kitchen. I'm sure you have recognized their sweet and oily smell as you walked by a carousel or along the food stalls at the fair. I first tried them when mom made us those at home one morning. It was a special treat - sweet sugary funnel cakes for breakfast! Those cakes are very easy to make and the only real 'tool' you should have on hand while preparing them is a funnel. However, if you don't have one, I'm sure there are plenty of things around your kitchen that can make great substitutes. Pastry bag with a small tip, empty ketchup bottle (for a more uniform line) or even some heavy-duty foil wrapped into a funnel shape would work. Whisk all the ingredients together to a uniform consistency. Pour through a funnel in a saucepan of hot oil. Fry for a few minutes on each side, turning once, until golden. Sprinkle with powdered sugar and serve immediately. I will always love those simple cookies as they remind me of childhood. My grandmother used to make them often when I was a little girl. Now I know why – calling for very few staple ingredients, they were easy and quick to make. Yet, they were always satisfying with their crumbly texture, crisp edges and appealing sugar tops. My grandma used to call them cutters, I guess because of the dough preparation method. There are ways to play around with the basic recipe by adding a little vanilla extract for flavor or changing the sweetness balance by increasing the amount of sugar used. 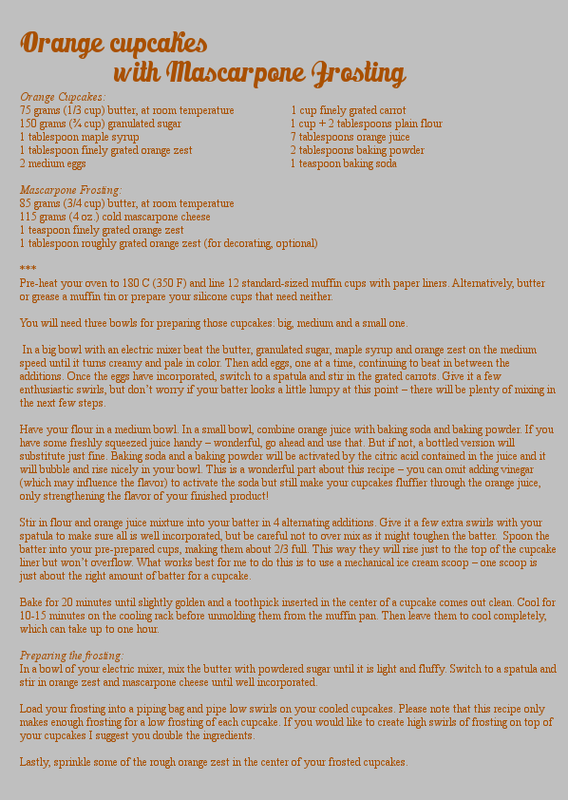 Here, however, I list the basic recipe – just like my grandma used to do. One of the ways people distinguish food groups is by color. The five food color groups – white, red, green, blue, and orange – summarize what their ‘members’ bring to you in terms of nutrition. I associate the orange group with winter time as it is when juicy clementines crowd the supermarket shelves and yams finally make it to German groceries. On cold winter days like today, I love bursting out the orange buddies in my kitchen. What is in an orange food group, you might ask? It includes all the wonderful fruits like oranges and lemons, cumquats and yellow apples, cantaloupe, peaches, papaya, but also veggies like winter squash, carrots, pumpkin and yams. All things orange! This group is rich in Vitamin A and C, beta-carotenes, and does all sorts of good for strengthening your immune system. Above all – it’s tasty and pleasant to look at. I think of it as little rays of sun, so dearly missed when the days are short, the nights are long, and the warmth is to be longed for. Little rays of sun shone in my kitchen today – and the recipe was too sweet not to share. 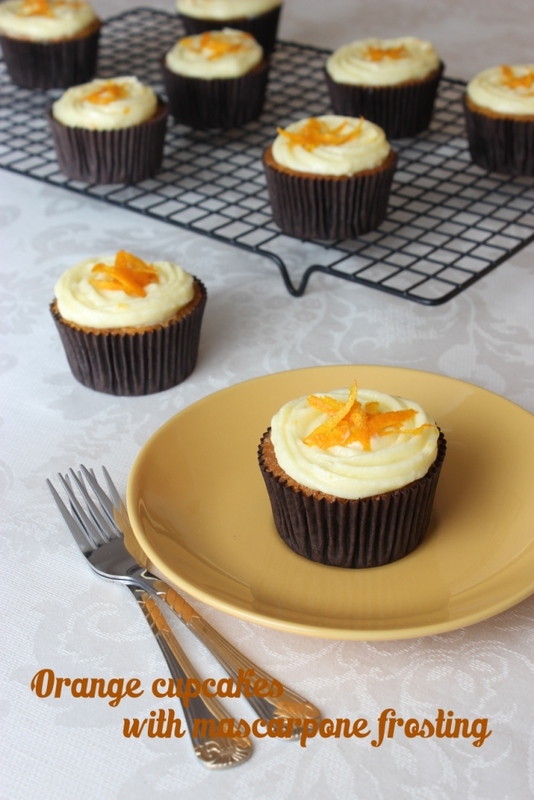 It’s my slight tweak of William Sonoma carrot cupcakes. After my Sweeter Half and I did ‘taste tests’ on them this afternoon, half of them magically disappeared. They are moist, rich with orange flavor and fluffy. I hope you'll enjoy them just as much. Bon Appétit!